The sun is a huge, inexhaustible, absolutely safe energy source. There is a growing conviction that the power industry of the future has to be based on the large-scale use of solar energy. Reliance on the solar-powered industry must be considered not only as a sure choice but also as the only alternative for mankind as a long-term prospect. The cost of developing a new energy basis is never small. Fortunately, a scientific and technological basis exists as a result of the advancements of electronics, laser techniques and electric power engineering for spacecrafts, which may serve as the starting point for the development of the terrestrial solar electric power industry based on application of semiconductors. Edmond Becquerel first observed the photovoltaic (PV) effect in a liquidsolid interface in 1839.W.G. Adams and R.E. Day carried out the first experiments with solid-state photocells based on selenium in 1876 . It took more than a half a century for the creation of the first solar cells with an efficiency barely exceeding 1%. These were thallium sulfide photocells with a rectifying region . The investigations were carried out under the leadership of Academician A.F. Ioffe, who in 1938 submitted a programme for the use of solar photovoltaic roofs for consideration by the USSR government. 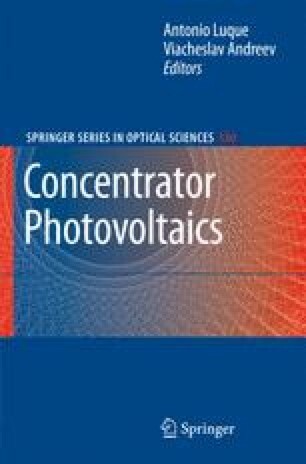 A decisive event was the creation in 1954 of silicon-based photocells with a p-n junctions that were characterized by an efficiency of 6% .